For the last 3-4 years I am no longer a soap person.I always tend to drop my soap ,besides I dont like if the soap melts & becomes sloppy.Using a body-wash felt quite effortless! It would take nothing short of luxury to tempt me to use a soap again. 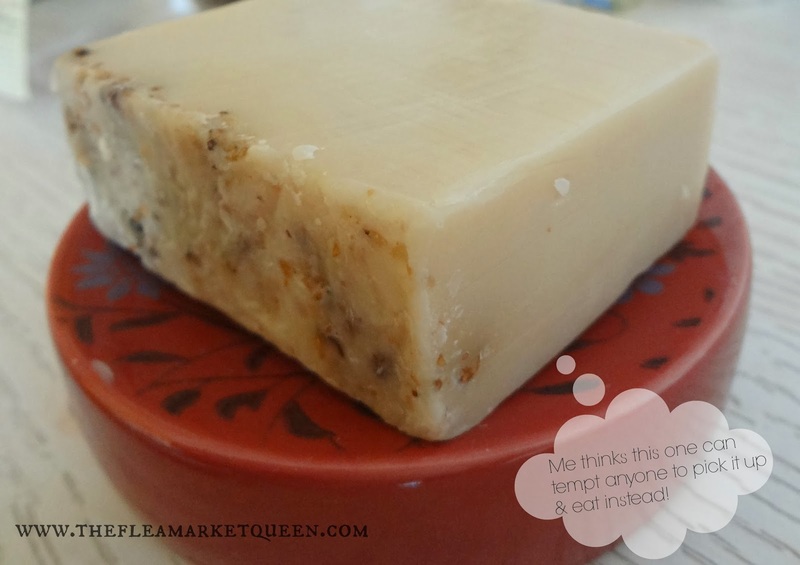 On my recent trip to Turkey, I got attracted to handmade olive oil soaps which are fabulous. Luckily Nyassa has olive oil soaps which I will review next. 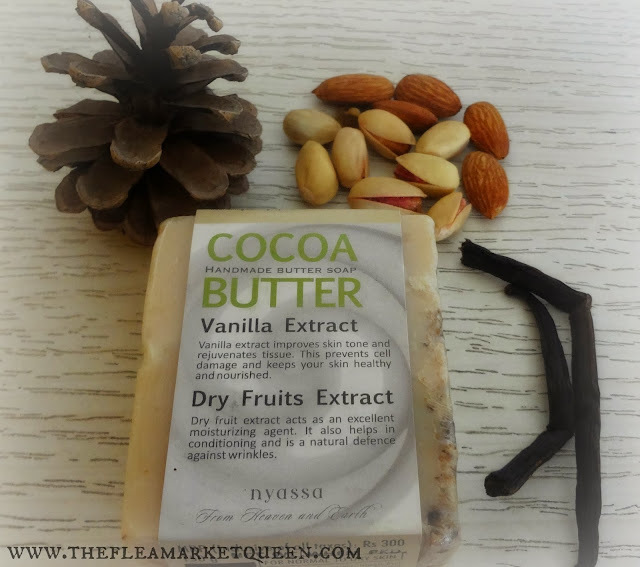 In the past I have used Nyassa's Vanilla Dry fruit bar. 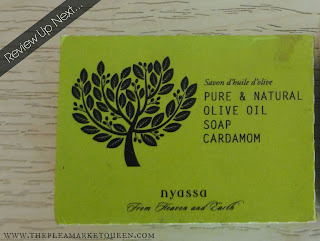 The current line-up from Nyassa is so tempting, I have made a list of To-be-tested and it seems never-ending! Vanilla Extract - Vanilla Extract impoves skin tone & rejuvenates tissue. This prevents cell damage and keeps your skin healthy and nourished. For best results, a rub or two will give excellent lather & the soap will last much longer. Please keep the soap dry between use. I love dressing up everything. That pine fruit is from my recent trip to Vienna,AUSTRIA. Vanilla sticks from GOA. Cocoa Butter,Vanilla, Almonds,Pistachio,Dry figs, Aloe vera, sweet almond oil....I am almost fainting with the goodness! I love this Ceramic Soap dish I got from LIFESTYLE HOMECENTRE. 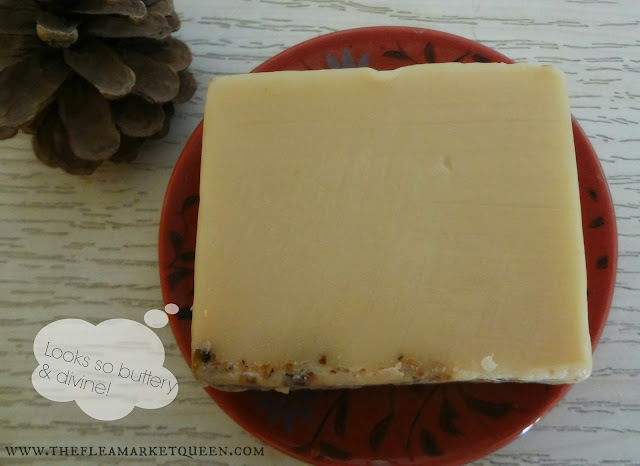 It is ideal for handmade soaps. So earthy! The soap feels like a dollop of hardened butter in your hands. Me LIKES! The inclusion of dry-fruits on one side makes it feel like some royalty bath ritual ! 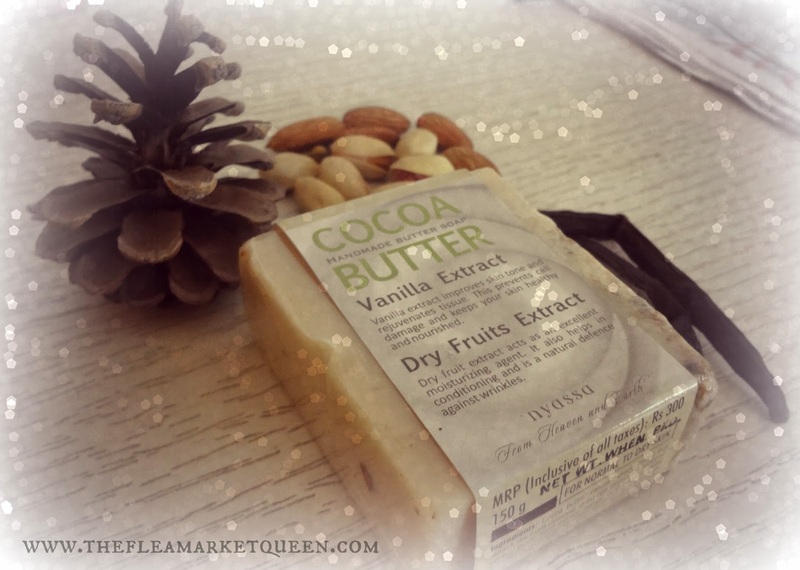 The cocoa-Vanilla fragrance is so intensely natural, it uplifts the senses. Its like a mini Spa at home. It doesn't melt & stays firm. The lather is minimal indicating minimal use of harmful lather agents (SLS). Another thumbs up! This soap is a treat to the senses & the quality is unmatched. The only lowdown is the price tag. Also, I would prefer if the ingredient percentages were mentioned in the label. Yes. Very much, if you consider natural ingredients as a way of life. Bathroom luxury is another level of pampering your worn out senses. Feeling low? Rub on some soap,girl! The moment this soap graces your bathroom shelf, you know you are are in for a luxury ride! 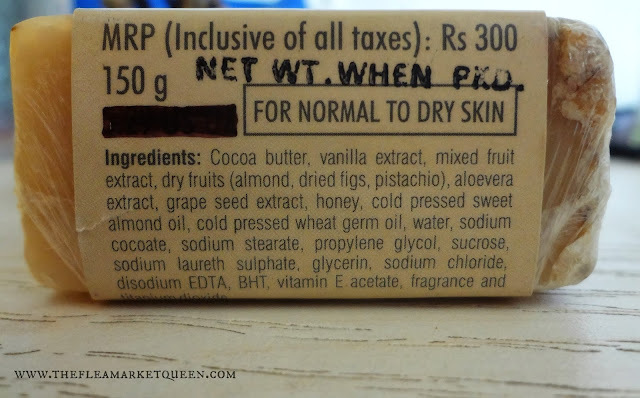 As for me, I wish,the price tag of INR 300 was almost half. Luckily for a single person usage, this soap lasts a good one month & more.Treasuring it as I go, using sparingly so that it lasts as long as it can! Hoping,one day, this will be my regular soap! Sigh! Here's a sneak peek of the next yummy soap in town: Review coming soon. Thanks Juelz :) Glad you stopped by!